The Nobel Prize is an often-politicized award that is criticized for increasing evidence of bias and possibly even corruption. It has been ostensibly given for achievements in physics, chemistry, medicine or physiology, literature, and peace. Named in honor of Alfred Nobel, the first prize was granted in 1901. He would state, "To the person who shall have done the most or the best work for fraternity between the nations and the abolition or reduction of standing armies and the formation and spreading of peace congresses." The award for economics, the "Sveriges Riksbank Prize in Economic Sciences in Memory of Alfred Nobel," was added in 1969 and is sometimes called a Nobel Prize. As an unwritten rule, the award is not given to a conservative (such as Ronald Reagan or Pope John Paul II) or scientists advocating intelligent design, and it is not given to anyone who challenges the scientific establishment on the issues of the theory of evolution or theory of relativity, such as standouts Raymond Damadian, Fred Hoyle and Robert Dicke. The Nobel Prize is not given to any scientist who criticizes, publicly or privately, a liberal icon; the renowned physicist Edward Teller was denied the prize for criticizing the liberal J. Robert Oppenheimer, and the eminent physicist John Wheeler was denied the prize for privately supporting Teller. In the case of Hoyle, the liberal Nobel committee humiliated him by awarding the prize to an underling on Hoyle's work, but not to Hoyle. In 1949 the Nobel Prize in Medicine was given to Dr. Egas Moniz for his pioneering work in frontal lobotomies, legitimizing the practice. Tens of thousands of handicapped victims were permanently maimed and mutilated in the United States alone by this barbaric procedure in the following years. The award is sometimes given to a liberal politician or diplomat, such as Al Gore, Barack Obama, and Henry Kissinger, which can be seen as boosting his agenda. Most recently the award has been the subject of an investigation for corruption. To nominate somebody for a Nobel Prize, the nominating party must meet the requirements outlined for the specific category or has to be invited. 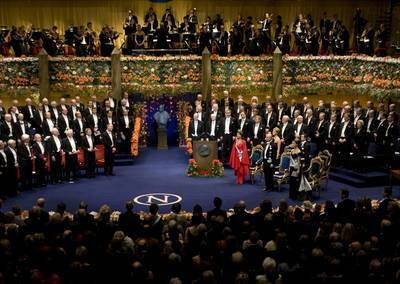 The Nobel Prizes are represented externally by the Nobel Foundation, a private institution entrusted with protecting the common interests of the Prize Awarding Institutions. However, the Nobel Foundation is not involved with the selection process itself. The Prize-Awarding Institutes are independent of government agencies and the Nobel Foundation itself. The multiple Prize-Awarding Institutes are all located in Sweden, except for the Nobel Peace Prize which is awarded by the Norweigian Nobel Committee which is appointed by the norweigian parliament. While the actual selection process is completely secret, and people often disagree with it, there are a few things that can be said about the process, at least for the physical sciences. First, the recipient must be living at the time of the selection. (This is true for all Nobel Prizes.) Tragically, Rosalind Franklin, who worked with James Watson and Francis Crick on the discovery of the DNA code, died before she could receive the award. Peter Higgs lived to see the discovery of the Higgs Boson confirmed, receiving the award at the age of 84, after a wait of more than 50 years. Many people were concerned that he might not make it. Second, and perhaps most importantly, the discovery, if it is a theoretical one, must have withstood the test of time. This means that extremely important achievements sometimes go unrecognized for decades (as in Peter Higgs' case), as the scientific community decides whether it really had the necessary far-reaching qualities. The Nobel committee does not like to find that something they awarded a prize for turned out to be wrong. Some theoretical advances that seemed very profound and revolutionary turned out to be wrong. An example is Fred Hoyle's "steady state creation" theory, which essentially created the field of cosmology, at a time when it was not yet a respectable field of study. He made other groundbreaking contributions to cosmology (for example, explaining where the chemical elements came from), but never received a Nobel. Another example was the Brans-Dicke gravitation theory. Robert Dicke never received a Nobel, even though he had other groundbreaking insights into the Big Bang theory and the cosmic background radiation, devised very sensitive tests of General Relativity, and invented equipment used in a lot of astronomical observations. So it's really hard to say. Ronald Reagan is widely credited for causing the peaceful elimination of short-range nuclear weapons in Europe, for demanding the destructions of the Berlin Wall, and for the end of communist control over Eastern Europe. He stood for freedom at every opportunity. He lived for more than a decade after his achievement, yet the Nobel Peace Prize was repeatedly given to liberal figures who accomplished far less, including the president Reagan defeated in 1980, Jimmy Carter. Frequently the Nobel Peace Prize is given to non-Christian or liberal Christian religious leaders, but it refused to honor Pope John Paul II for his pivotal role in liberating his native Poland from communist control. He blamed politics and the fact he was known as the "father of the hydrogen bomb." His protégé, Lowell Wood at Livermore, said that if it were not for the bomb "chances are two to three he'd get the Nobel Prize. He's commented to me that if he reared up on his hind legs and denounced the U.S. government, he'd be a good candidate." John Wheeler was denied the prize for privately supporting Teller. The omission has been publicly regretted by later members of the Nobel Committee; when the Dalai Lama was awarded the Peace Prize in 1989, the chairman of the committee said that this was "in part a tribute to the memory of Mahatma Gandhi". The Prize in 1948 (the year of his death) was not given, so this could be seen as Gandhi's peace prize, as it is not awarded posthumously. Raymond Damadian developed magnetic resonance imaging (MRI), a phenomenal medical innovation deserving of a Nobel Prize. But Damadian is reportedly a Young Earth Creationist, and the Nobel committee never recognizes the achievements of someone who criticizes the theories of evolution and an old earth. Accordingly, the Nobel committee insulted Damadian by passing him over and giving the Nobel Prize in Physiology or Medicine in 2003 to Paul Lauterbur and Peter Mansfield "for their discoveries concerning magnetic resonance imaging". Damadian, who had outlined the use of Nuclear Magnetic Resonance to detect tumors in 1971, protested against his omission from the Prize and said that his "life's work has been stricken." He then took out full-page ads in several newspapers, describing his omission as a "shameful wrong". The first wave of ads appeared in The Washington Post, the Los Angeles Times, Dagens Nyheter (daily newspaper in Stockholm), and The New York Times. It has been debated, though, whether it is acceptable to complain about not receiving a Nobel Prize, as almost an attempt to force it to be awarded to someone. The foremost British scientist of the 20th century, Fred Hoyle, was inexplicably passed over for a Nobel Prize. It was awarded to William Alfred Fowler (with Subrahmanyan Chandrasekhar) for "for his theoretical and experimental studies of the nuclear reactions of importance in the formation of the chemical elements in the universe." Fowler's work on this was under the direction and leadership of Hoyle, and Fowler himself was "stunned" that Hoyle had been passed over for the prize. The prize for the 1957 discovery was awarded during a time when Fred Hoyle was embarrassing evolutionists by exposing as a fraud the Archaeopteryx at the British Museum of History. The slight of Hoyle seemed to have been a punishment for criticizing a central claim made by the theory of evolution. Perhaps the foremost American physicist of the 20th century, Robert Dicke of Princeton University was a prominent critic of the theory of relativity. Dicke supported an alternative theory that had "enjoyed a renaissance in connection with theories of higher dimensional space-time." But despite being one of the most accomplished physicists having numerous contributions, Dicke was repeatedly passed over for the Nobel Prize. In one egregious case, the prediction and discovery of cosmic background radiation from the Big Bang, the prize was embarrassingly given to less deserving scientists. The Nobel Prize committee has often given the award in this manner as away of punishing someone more deserving for criticizing a theory preferred by the committee. Equally there have been several instances where prizes were awarded to those whom many felt did not deserve the honor. Controversy in this regard has been especially acute in the award of the Peace Prize. When Henry Kissinger was awarded the prize in 1973 the American satirist, Tom Lehrer, observed that this had rendered political satire 'obsolete'. Many were outraged by the award to Yasir Arafat in 1994, who was reportedly associated with the Munich massacre of Jewish athletes in 1972. Only days after Mikhail Gorbachev received his Peace Prize in 1991, Soviet troops were ordered into the sovereign republic of Georgia and shot unarmed civilians, killing hundreds. In 1978 Menachem Begin won the Peace Prize, who then started the 1982 Lebanon War culminating in the Sabra and Shatila massacres. The Peace Prize has often been awarded only a year or so after the political events that have merited the award, and not for lifetime achievement. The Arafat award is particularly controversial in this respect. Further politicization of the award occurred in 2007 when Al Gore was given the peace prize for promoting the dubious theory of man-made Global Warming, a political agenda that has no clear connection with what is true peace. Bias is facilitated by the haste in awarding the Peace Prize, which in Gore's case seemed to be timed to boost a potential presidential campaign. Continuing with the trend of awarding Peace Prizes to the undeserving, Barack Hussein Obama was awarded one in 2009. Some praise the Nobel Peace Prizes given in 1991 to Aung San Suu Kyi for her heroic struggle against the brutal military dictatorship in Myanmar (Burma) and the award in 1996 to Jose Ramos Horta and Bishop Belo of East Timor in recognition of their struggle against the oppressive and, at times, genocidal occupation of that country by the Indonesian government. The awarding of the prize in 1984 to Archbishop Emeritus Desmond Tutu, was condemned by the apartheid regime as a political ploy, but celebrated everywhere else, as was the joint award to Presidents Nelson Mandela and F.W. de Klerk in 1993, for their efforts in uniting South Africa in the build-up to the first fully democratic elections. In 2008, Horace Engdahl, the head of the Swedish Academy, was reported to have said that American novelists would never win the Nobel Prize for Literature, as the American novel was "too isolated and insular." It took 30 years for an American to be awarded the Nobel Prize for Literature, despite most of the best writing of the era coming from America. When an American finally won, it was the socialist Sinclair Lewis in 1930, whose writing often bears a strong resemblance to anti-American, socialist propaganda. The prophet Moses wrote the Torah which is the first five books of the Bible. Moses was a creationist. Rabbi Ismar Schorsch said relating to the history of the Jews: "The primacy of the Torah required literacy and learning of everyone. Henceforth, leadership would be determined by study rather than birth." ↑ Creation on the Web: Super-scientist slams society’s spiritual sickness! ↑ Bloodshed in the Caucasus. Violations of Humanitarian Law and Human Rights in the Georgia-South Ossetia Conflict. Human Rights Watch. April 1, 1992. On January 5, 1991, which is Christmas Day locally, tanks and artillery from Russia's 58th army and Russian Interior Ministry (MVD) were dispatched to South Ossetia. ↑ See also April 9, 1989 Massacre of Women in Tbilisi by Russians Video. ↑ Incidentally, the awards to Tutu and Mandela have resulted in Vilakazi Street in Soweto, Johannesburg, becoming the only street in the world to be home to two different laureates. This page was last modified on 15 April 2019, at 15:49. This page has been accessed 112,790 times.